Feliz - our huge banquet hall offering flexible meeting space to accommodate upto 400 guests, a board room with seating capacity ranging from 10 to 20 guests, WiFi/High speed broadband internet access available, State -of-the-art audio-visual support, in-house meeting/ event coordinators to assist you in planning. The impeccable style and contemporary look of Feliz Hall gives that special feel for any event. 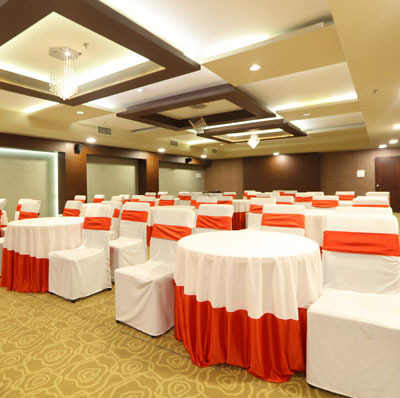 Whether a corporate meeting, product-launch, symposium, conference or wedding, ‘The Orbis’ offers the perfectly located venue for all kinds of events in Coimbatore, in the dignified ambience of a luxury hotel. Elegant banquet arrangements, conference halls and state-of-the-art facilities are just some of the options featured in our event arrangements.